Narendra Modi: Modi Is Threading A Path Between A Rising China And An Uncertain U.S. US Defense Secretary James Mattis described India as the “fulcrum’’ of security in the Indo-Pacific region as he travelled this week to an annual security conference in Singapore, attended for the first time by an Indian leader. But if Mattis was hoping that Prime Minister Narendra Modi would use the platform to join the US, Japan and Australia -- a grouping known as the Quad -- in a more muscular challenge to China’s regional expansion, he was disappointed. Instead, India’s strongest leader in decades navigated carefully between the two regional military powers. “Asia and the world will have a better future when India and China work together in trust and confidence, sensitive to each other’s interests,” Modi told defence ministers and military officials assembled for the Shangri-La Dialogue, an event organised by the London-based International Institute for Strategic Studies. He did echo US appeals for “freedom of navigation, unimpeded commerce and peaceful settlement of disputes in accordance with international law.” And he attacked governments that put other nations under “impossible burdens of debt.” Both were likely references to China for its behaviour in the disputed South China Sea and its Belt and Road Initiative infrastructure projects -- which can come courtesy of large loans -- in other countries. Yet Modi has done something of a turnaround on China in recent weeks, a far cry from his ground-breaking shift to deepen engagement with the US when he came to power in 2014, which was accompanied by a show at home of standing up to China’s rise with a more robust “act east’’ policy. Tensions came to a head last summer when Indian and Chinese troops engaged in a standoff over a long-running border dispute. To embrace a more proactive India, the US re-branded its Asia-Pacific policy as “Indo-Pacific,” a change that fuels Chinese concerns about containment. At the end of April, when the world’s attention was focused on an historic summit between the leaders of South Korea and North Korea, Xi invited Modi for two days of informal talks in central China. Around the same time, reports emerged that India decided against inviting Australia to join annual naval exercises with India, Japan and the US –- something Washington wanted and Beijing didn’t. Next week, Modi will travel to China again, for a summit of the Shanghai Cooperation Organization, a security body dominated by China and Russia that India joined as a full member last year. Whether these gestures represent a policy shift, or simply a desire to ensure there’s no embarrassing repetition of last year’s border clashes ahead of Indian elections in 2019, is a matter for dispute among Indian foreign policy analysts. There’s also the question of how much of any thaw might be down to Xi, who has embarked on outreach with rivals including Japan as China faces pressure from US President Donald Trump over its trade policies. 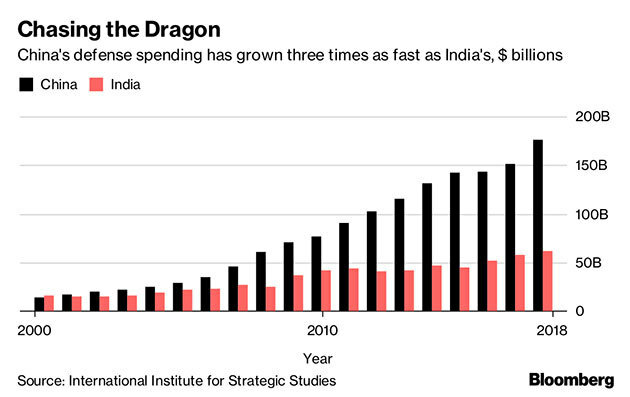 For some, the change is real, driven by a growing recognition that India simply lacks the economic and military capacity to compete with China, combined with growing uncertainty over the reliability of the US. “Reality has hit home’’ when it comes to measuring up to China’s power, said Kanti Prasad Bajpai, director of the Centre on Asia and Globalisation at Singapore’s Lee Kuan Yew School of Public Policy. China’s military budget is more than three times as large as India’s, and its economy almost five times as big. “Modi has simply understood that after a certain point India is not in a position to bear its fangs to China, especially given the unreliability of the US under Trump,’’ he said. The raw spending numbers may even underestimate the disparity in hard power between the world’s two most populous nations. 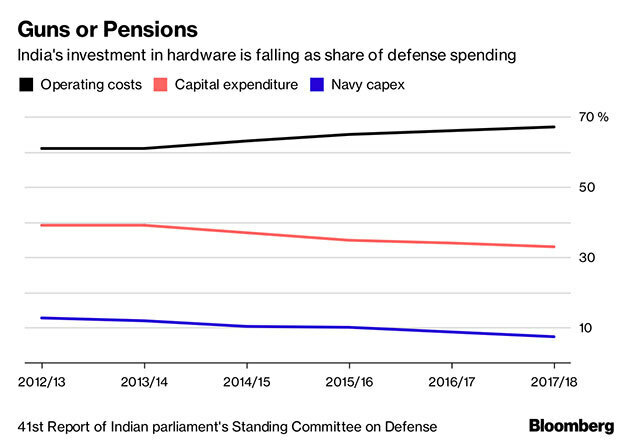 Whereas China has plowed resources into developing and buying high-tech weapons, India spends as much as two-thirds of its defense budget on routine expenses such as personnel. In recent years, the per centage of the budget spent on capital investment has fallen. When it comes to competing economically for the loyalties of countries in the region, the gap is even wider. India has no response to China’s Belt and Road program, according to Syed Munir Khasru, director of the Institute for Policy, Advocacy and Governance, an international think tank headquartered in Bangladesh. For others, though, the change is only one of optics, geared to the coming election. The security establishment remains alarmed by Chinese military expansion, in particular by signs it is looking for footholds in the Indian Ocean, which India has always seen as its preserve, said Rahul Roy-Chaudhury, who heads the South Asia program at IISS. Modi is simply seeking to ensure tensions don’t flare up for the next year, he said. At the same time, India doesn’t want to let the US draw it into a confrontation with China over the South China Sea, where China’s territorial claims cross over with nations such as Vietnam and the Philippines. India has always been leery of freedom-of-navigation operations -- where ships sail through areas of contention to make a point -- and of developing the Quad into a security-focused organization.